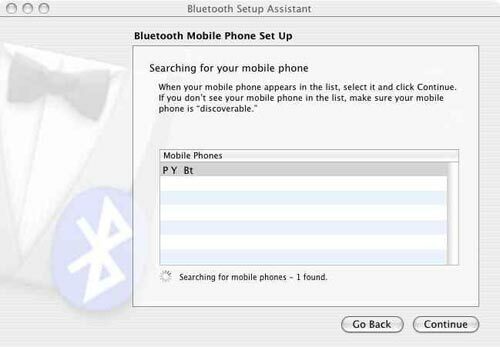 Take one Bluetooth cell phone. Stir until done. Long ago Santa delivered a banana seat tricycle with exotic tiger skin markings to my three-year-old brother. Tony's delight was complete. We'd often glimpse him petting his tiger trike, murmuring appreciation. At that point I lacked Tony's precocious keenness for exceptional technology. But I eventually gushed over the arrival of my first computer system in 1990. It was a Mac IIci with 13" color RGB monitor and a 300 dpi GCC laser printer. I suddenly had vastly more CPU MHz, system memory, disk space, VRAM and display pixels than any of my colleagues. And almost no one had a laser printer at home. But it wasn't the high-end computer that evoked the bulk of my cyber-devotion. What enthralled me most was the exquisite box of hardware connected to the serial port: a Practical Peripherals 2,400 bps modem. While the Mac II system was itself a cluster of cutting edge computing jewels, alone it seemed isolated, a quarantined island of powerful but inert utility. Yes, it allowed me to create and edit text swiftly, manipulate images, store and process financial data, and have fun with a few games. I always took Blake’s original poem, on farthings and gold, as meaning something tiny placed in circulation is wisely used because its benefits far exceed the value of huge but hoarded items. And so information should be as freely distributed as feasible. A modem allowed a computer to communicate and to enlarge its realm a thousand-fold. It could share what it created and stored, and it could partake in what other systems offered to share. Now in 1990 the Internet was in infancy, a loosely federated realm of military and educational data networks. The public was confined to proprietary oases of information offered by CompuServe, Prodigy, GEnie, and America OnLine. And to your pals with modems. Rather than wait for the Post Office to deliver a floppy disk with the latest patch or shareware utility, friends could transmit these chunks of data among themselves in few minutes. I could harvest files, solve technical problems and keep abreast of cyber-news by trading messages with other Mac users logging into a computer bulletin board. You could have seen me stroking that Practical Peripheral box, thanking it for its wondrous service. 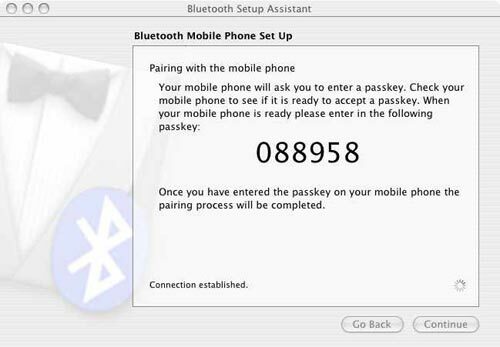 What a miracle: the purring of dial tone, phasing to cackling handshake, leading to shared data. Within a few months I upgraded to a U.S. Robotics Courier V.32bis 14,400 bps, and the added bandwidth greatly expanded the possibilities. I still treasure these modems, and have retained them in a collection, from a 300 bps model through V.92 56k versions for Mac and PC, and even a spare Motorola cable modem. Perhaps some day I'll open a Modem Museum, where a Monsanto Molecular Miniaturizer first shrinks visitors to packet proportions, streamlining their voyage through data space. But enough serious backwards gazing. Besides the "Tiger" emblems on Tony's trike, how is any of this relevant to Macintosh today? 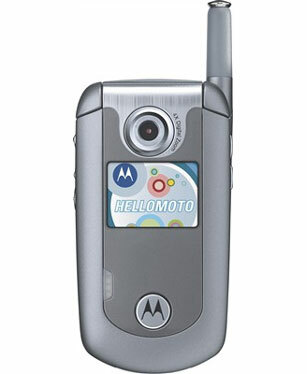 One recent morning I woke up and recognized my family had three additional modems for my collection: our cell phones. These connect to our Bluetooth-equipped Macs and allow 14 Kbps dial-up or 400 Kbps Internet throughput. Not only would they serve us well in an emergency when the office LAN, home cable, or DSL/phone systems are down, but their immediate benefit allows untethered Internet access. No special software is needed, because Mac OS X 10.4 Tiger furnishes everything we need. Configuring your phone and Mac via Bluetooth also allows you to synchronize your mobile address book and calendar with your Macs. 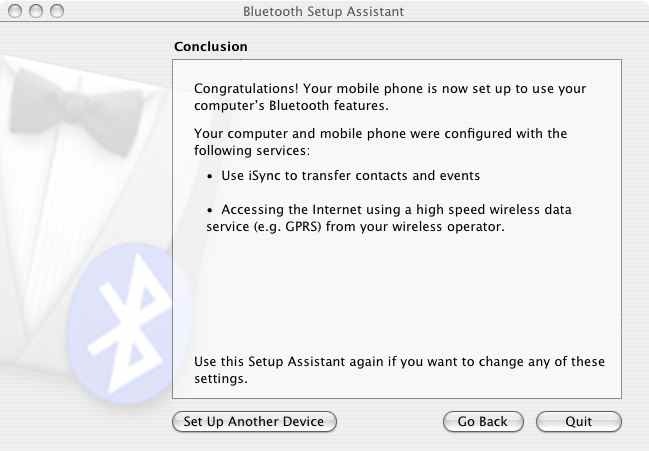 Here are the steps I took to configure my Motorola E815 phone for use as a data modem with two of our Macs. The cell phone modem may be used in two ways: to dial an ISP at 14.4 kbps; or to access the Internet via Verizon’s Mobile Web packet portal. I outline here the second and swifter channel. 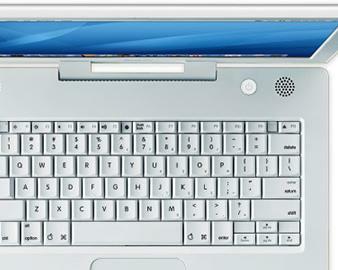 The procedure is the same for our Power Mac G5 2.5 GHz tower and 1.2 GHz iBook G4. 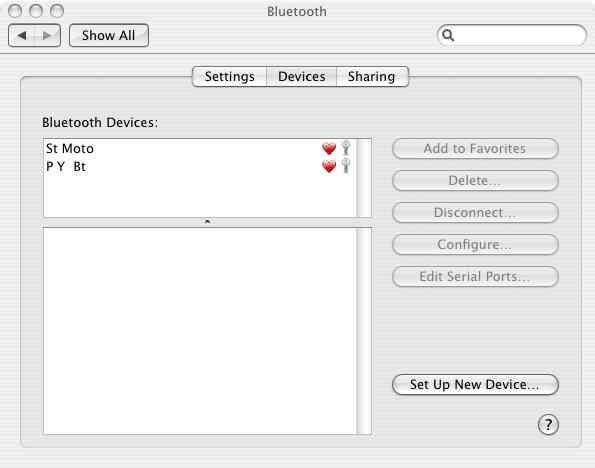 Both Macs were ordered with Apple factory-installed Bluetooth. I would guess that these steps would work with other Bluetooth enabled cell phones, particularly Motorola models such as the V710, ROKR, and RAZR. So you too may have a secret outpost on the modem frontier. While you need a Verizon plan with Mobile Web service, you do not necessarily have to pay the extra $5 per month for full Mobile Web activation to have the data modem function work. 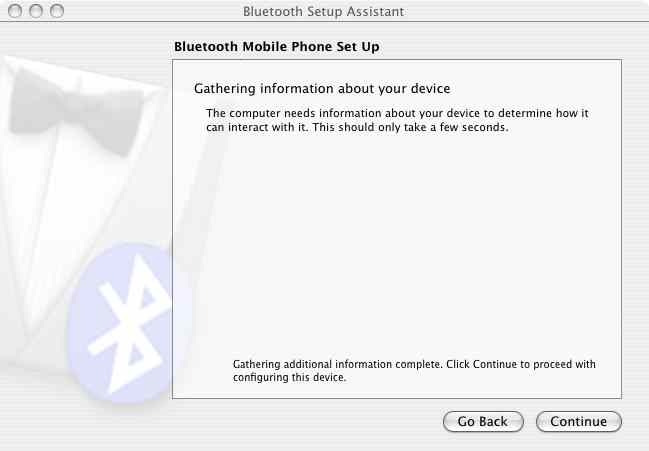 That allows you to use the phone itself as a mini-web browser, not our goal here. 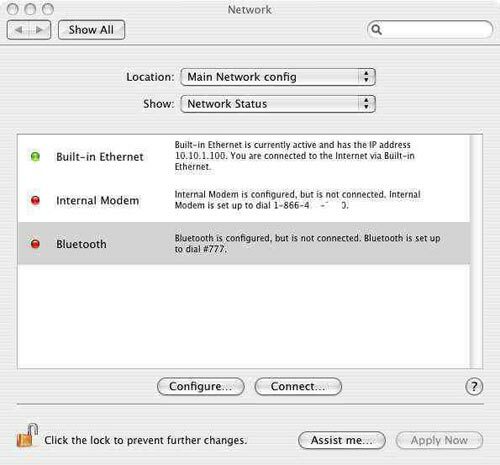 Our goal is to use the phone to permit the Mac to do web browsing and e-mailing. Mobile Web already works partially on all Verizon web-enabled phones, and that partial and no-charge enablement is enough. Can your phone use Mobile Web to check your account balance and minute usage? Doing so is free under all Verizon plans. 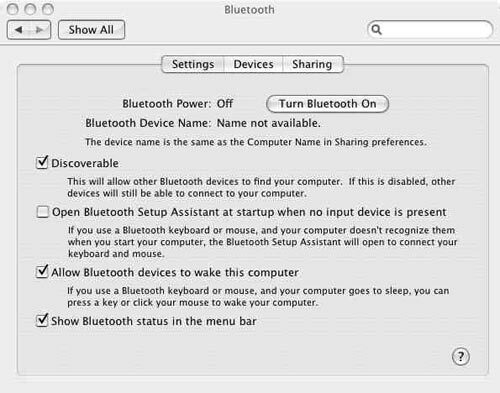 If you can, then these steps should work for you to permit your Bluetooth Mac to gain a wireless Internet link at virtually no cost except airtime. The Bluetooth Setup Assistant launches. 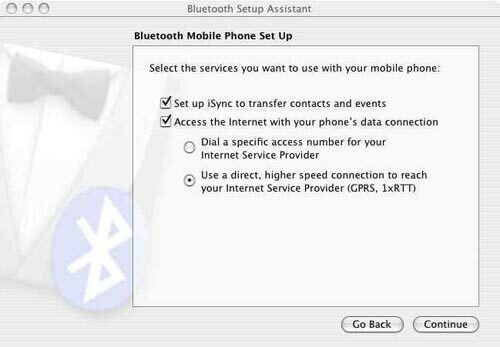 Click "Continue" on the initial screen then select the radio button for "Mobile phone:"
The phone should then show: "PIN verified and saved." 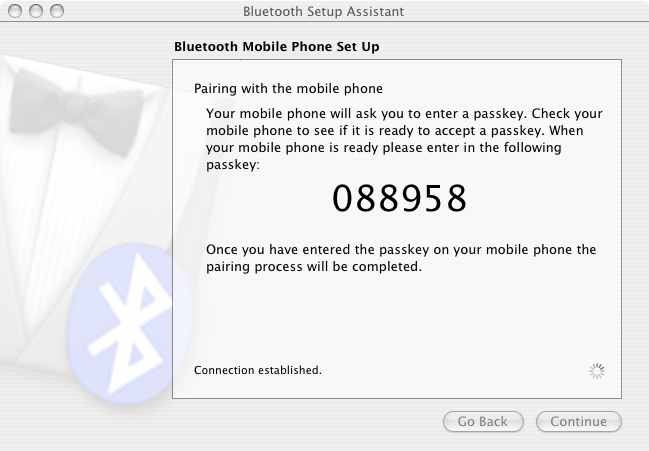 The phone and Mac are now securely paired. 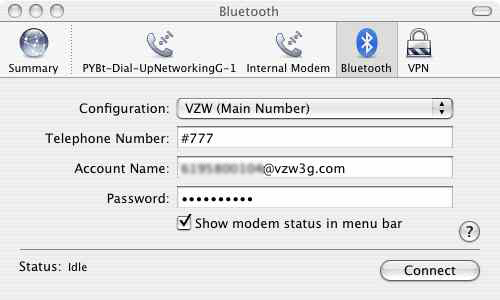 In the Username box, type your mobile phone number without dashes or spaces, followed by: @vzw3g.com. Enter a few random characters in the Password box; choice is irrelevant, and you won't be asked to recite later. In the GPRS CID String box (also could be labeled "Phone Number"), enter: #777 as the phone number. If you highlight your phone's icon and click "Sync Devices" you can immediately test the Bluetooth link between Mac and cellphone, and make your address books and calendars identical. Some day if address data is lost or corrupted on either device, you can use the other to restore. 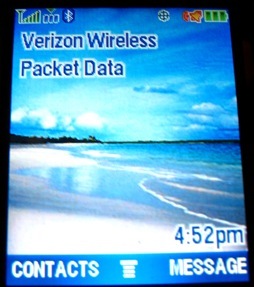 Verizon's phones usually arrive with dial-up networking disabled. To enable, simply key in: ##DIALUP ( ##342587). 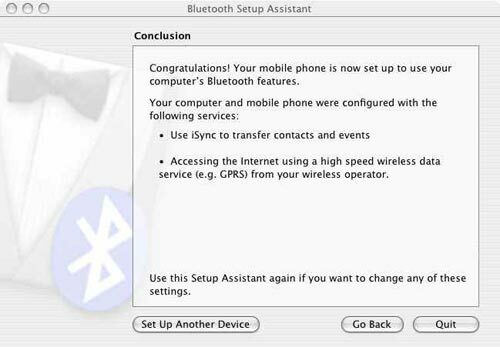 Do this briskly without pause, and the phone will show a dial-up networking confirmation screen at once. 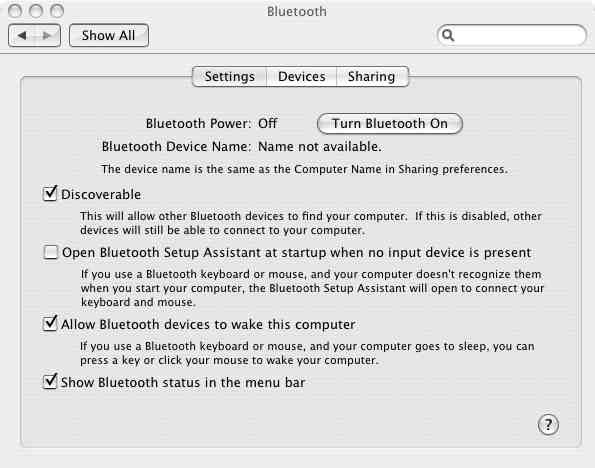 Use the same command to disable dial-up networking, if you don’t plan on using this feature for a while, to avoid accidental Bluetooth packet connections. 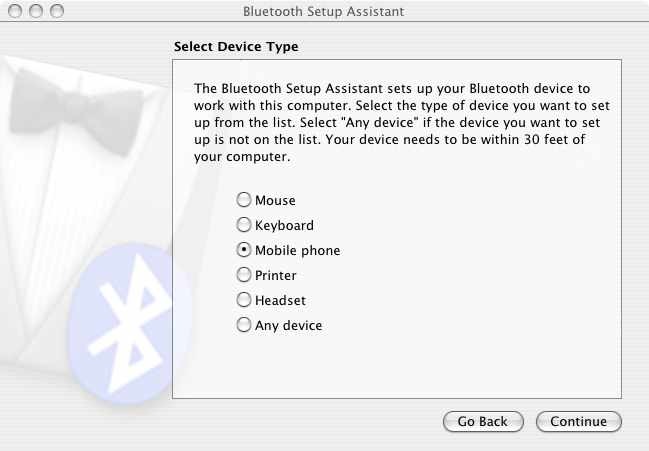 Select the Bluetooth configuration, and after clicking the Connect button, you will see the Bluetooth connection screen. 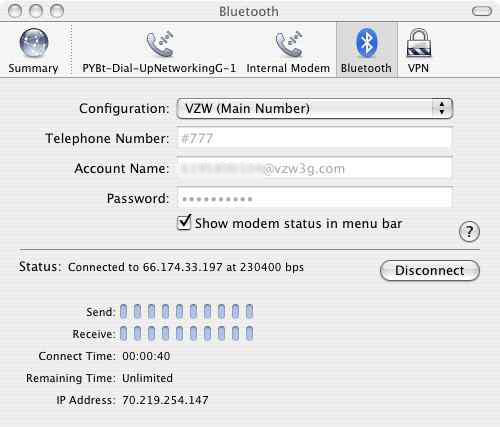 I named my Configuration "VZW:"
After clicking the "Connect" button, the phone should chirp and instantly make a packet connection with Verizon's network. There is no dial-up handshake dance as with standard modems. Its screen will show "Packet Data:"
Notice that the first, “Connected to” IP is the node on Verizon's network through which you're accessing the Internet, and the second IP is what VZW has assigned via DHCP to your phone-modem. Throughput tests I've run at: http://www.cable-modem.net/oct99/speed.html range from 80 kbps to 450 kbps. Clearly this setup is using some degree of data compression when the higher range is effective. If you have trouble making a connection for iSync or for Internet packet data, it may help to shut off and restart the phone. This clears the serial port. When the connection is idle, it first goes dormant, then after a longer pause, disconnects. The dormancy automatically saves you from using any airtime when you aren’t actively navigating the net. Caveat hoser: Proceed at your risk. 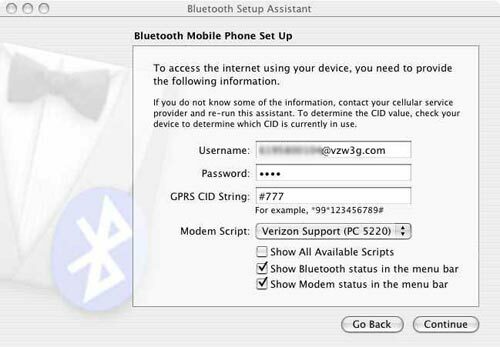 Because Verizon does not overtly support use of this feature, it's possible, although unlikely, that setting it up could hose your cellphone. Caveat walleto: My cell carrier is Verizon Wireless. Under my particular plan, only airtime is charged for use of the phone as a modem. After 9pm and on weekends, my usage has no strings attached whatsoever. Your plan may be different. If you can actually understand your plan, you may trace your genetic endowment to Max Planck or Albert Einstein. If you follow the steps here and receive an enormous bill from your cellular company, blame Max or Al, not me.